We’ll start this tutorial with a review of block devices and partitions, and then show you more about the fdisk, gdisk, and parted commands, which is used to create, modify, or delete partitions on block devices. You will also learn about the various forms of the mkfs command (mkfs stands for make filesystem); mkfs commands are used to format partitions as a particular filesystem type. Note: In addition to the tools and filesystems required for the LPI exams, you may encounter or need other tools and filesystems. Find a brief summary of some other available tools in Other tools and filesystems. See our Learn Linux, 101: A roadmap for LPIC-1 for a description of and link to each tutorial in this series. The roadmap is in progress and reflects the version 4.0 objectives of the LPIC-1 exams as updated: April 15th, 2015. As tutorials are completed, they will be added to the roadmap. This tutorial helps you prepare for Objective 104.1 in Topic 104 of the Linux Server Professional (LPIC-1) exam 101. The objective has a weight of 2. The examples in this tutorial come from several different systems and Linux distributions. Several use relatively small 16GB USB flash drives as an easy way of reformatting a whole disk without significant loss of data. Your results on other Linux systems may differ. Your hardware will also have different disks attached, so use the examples here as illustrations only. We have given some indication of the Linux distribution actually used as a comment on the first command in each listing, or on multiple commands if we illustrate with different distributions. 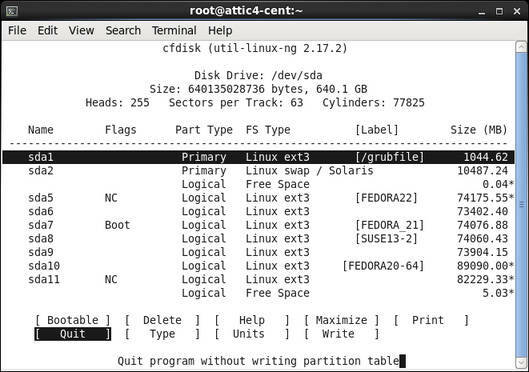 Our tutorial, “Learn Linux 101: Hard disk layout,” introduced you to hard drive layouts, partitions, and some basic use of the fdisk and gdisk commands to view partition information. You learned about the Master Boot Record (MBR), partition tables, partitions, including primary, extended, and logical partitions. You were also introduced to GUID Partition Table s (GPT), a new format used to address the size limitations inherent in the MBR layout. Finally, you learned that a Linux filesystem contains files that are arranged on a disk or other block storage device in directories. As with many other systems, directories on a Linux system may contain other directories called subdirectories. That tutorial also discussed the considerations that guide you in making choices about partitioning. This tutorial focuses on the LPI requirements related to the fdisk command for partitioning using MBR layouts and the gdisk command for partitioning using GPT layouts. A block device is an abstraction layer for any storage device that can be formatted in fixed-size blocks; individual blocks may be accessed independently of access to other blocks. Such access is often called random access. The abstraction layer of randomly accessible fixed-size blocks allows programs to use these block devices without worrying about whether the underlying device is a hard drive, floppy, CD, solid-state drive, network drive, or some type of virtual device such as an in-memory file system. Examples of block devices include the first IDE or SATA hard drive on your system (/dev/sda or /dev/hda) or the second SCSI, IDE, or USB drive (/dev/sdb). Use the ls -l command to display /dev entries. The first character on each output line is b for a block device, such as floppy, CD drive, IDE hard drive, or SCSI hard drive; and c for a character device, such as a or terminal (tty) or the null device. See the examples in Listing 1. For some block devices, such as floppy disks and CD or DVD discs, it’s common to use the whole media as a single filesystem. However, with large hard drives, and even with USB memory keys, it is more common to divide, or partition, the available space into several different partitions. Partitions can be different sizes, and different partitions may have different filesystems on them, so a single disk can be used for many purposes, including sharing it between multiple operating systems. For example, I use test systems with several different Linux distributions and sometimes a Windows® system, all sharing one or two hard drives. You will recall from the tutorial, “Learn Linux 101: Learn Linux, 101: Hard disk layout,” that hard drives have a geometry, defined in terms of cylinders, heads, and sectors. Even though modern drives use logical block addressing (LBA), which renders geometry largely irrelevant, the fundamental allocation unit for MBR partitioning purposes is frequently still the cylinder. Partition information is stored in a partition table on the disk. The table lists information about the start and end of each partition, information about its type, and whether it is marked bootable or not. To create and delete partitions, you edit the partition table using a program specially designed for the job. For the LPI exam, you need to know about the fdisk, gdisk, and parted programs, so those are what is covered here, although several other tools could be used. We will mention some at the end of this tutorial. The fdisk command with the -l option is used to list partitions. Add a device name, such as /dev/sda, if you want to look at the partitions on a particular drive. Note that partitioning tools require root access. Listing 2 shows the partitions on the primary hard drives of two of my systems. The header information shows the disk size and geometry. Most large disks using LBA have 255 heads per cylinder and 63 sectors per track, making a total of 16065 sectors, or 8225280 bytes per cylinder. In the second example, a logical partition (/dev/sda7) is marked bootable (or active). This flag normally enables the standard DOS PC master boot record to boot the partition. However, that loader can only boot primary partitions. This flag has no significance for the LILO or GRUB boot loaders. Both example now use GRUB2 as the boot loader, and the fact that /dev/sda7 is marked bootable is probably an accident of the history of my use of this drive. The Start and End columns show the starting and ending cylinder for each partition. These must not overlap and will generally be contiguous, with no intervening space. The Id field indicates the intended use of the partition. Type 82 is a Linux swap partition, and type 83 is a Linux data partition. There are approximately 100 different partition types defined. The second disk is shared between several operating systems, including Windows/XP, hence the presence of Windows NTFS (and possibly FAT32) partitions. Like the fdisk command for MBR formatted disks, the gdisk with the -l option is used to list partitions for GPT formatted disks. Add a device name, such as /dev/sda, if you want to look at the partitions on a particular drive. As with fdisk, gdisk require root access. shows the partition a GPT formatted hard drive of tone of my systems where the partition takes up almost half the available disk. Note the presence of a protective MBR. This enables programs that are unaware of GPT formatting to see the disk as if the whole disk were occupied by a single partition. Current versions of fdisk are aware of GPT formatting and will also display the partitions on a GPT formatted disk. The parted command is a partition editor that will work with both MBR and GPT formatted disks. shows the second disk from Listing 2 and the disk from . Note the different physical sector sizes on the two disks. You have just seen how to display partition information using the fdisk, gdisk, and parted commands. These commands also provide a menu-driven environment for editing the partition table to create or remove partitions. Before you start modifying partitions, there are some important things to remember. You risk losing your existing data if you do not follow these guidelines. Back up important data before you start, as with any operation that may cause data loss. Do not change partitions that are in use. Plan your actions and execute them carefully. Booting a live distribution from CD, DVD, or USB is one good way to ensure that no hard drive partitions are in use. Know your tool. The fdisk command does not commit any changes to your disk until you tell it to. Other tools, including parted, may commit changes as you go. Stop if you do make a mistake. Partitioning tools write the partition table. Unless the tool you are using also includes the ability to move, resize, format, or otherwise write to the data area of your disk, your data will not be touched. If you do make a mistake, stop as quickly as possible and seek help. You may still be able to restore your previous partition table definitions and thus recover your partitions and data. If you need to change partitions that are normally in use, you will probably want to do it from a live CD or USB stick. For our first example of adding a partition using fdisk, we’ll use a Knoppix 7.4.2 live DVD. To start fdisk in interactive mode, simply give the name of a disk, such as /dev/sda or /dev/sdb, as a parameter. You will need root authority, and you will see output similar to Listing 5. Older versions of fdisk may give you a warning about disks with more than 1024 cylinders. If your BIOS is very old and does not support booting from beyond cylinder 1024, this may apply to you, but most systems today will not be affected by this limit and modern versions of fdisk no longer display the warning. You may also find your version has a -c option to turn off DOS compatibility mode. this is generally recommended and will also suppress some warnings. Type m to display a list of available one-letter commands as shown in Listing 6. Use the p command to display the existing partition on this disk. Listing 7 shows the output. This particular disk is a 640GB disk with two primary partitions, /dev/sda1 and /dev/sda2, and an extended partition /dev/sda4 which contains 8 logical partitions. There is one Linux swap partition. Let’s now use part of the very small amount of free space at the end of the disk to add a primary partition which we will eventually format as FAT32. Start by using the n command to create a new partition; see Listing 8. A primary partition must be numbered 1 through 4, so once we selected p as the partition type, our only choice for partition number was 3 as the disk already has 1,2 and 4 in use. We specified 1250258625 as the starting sector as it is one sector beyond the last sector in use for /dev/sda12. We took the default for the ending sector as the last sector on the disk. The new /dev/sda3 partition has 2551 1K blocks, so it is indeed tiny. It is a good idea to assign partition numbers sequentially; some tools complain if this is not done and fdisk warns us that our partition table entries are no longer in disk order. Notice also that our new partition was assigned a type of 83, for a Linux data partition. Think of this as an indicator to the operating system of the intended use of the partition. The eventual use should match this, but at this point we don’t even have the partition formatted, let alone have any data on it. We’ll change the partition type in a moment. You may have noticed that when we entered the n subcommand to create a new partition, the only choices were ‘l’ for logical and ‘p’ for primary. You will only see options for the possible types of partitions that you could create. You would see ‘e’ for extended if the drive did not already have an extended partition. Also note that our extended partition (/dev/sda4) is type 5. Before we leave fdisk, we will change the partition type for our new partition. We do this using the t subcommand to set the partition type. We set /dev/sda3 to type b (W95 FAT32). If you want to see the full list of supported types, enter L as you see in Listing 9. So far, we have just been doing an in-memory edit of a partition table. We could use the q command to quit without saving changes. If something is not how you want it, you can use the d command to delete one or more partitions so you can redefine them. If you are happy with your setup, use the v command to verify your setup, and then the w command to write the new partition table and at which point fdisk exits. See Listing 10. If you run fdisk -l again, you will see that Linux now knows about the new partitions. Unlike in some operating systems, it is not always necessary to reboot to see the changes. A reboot may be required if, for example, /dev/hda3 became /dev/hda2 because the original /dev/hda2 was deleted. If a reboot is needed, fdisk should tell you to do so. Neither LILO nor GRUB uses the bootable flag. If either of these is installed in the MBR, then it can boot any partition, whether primary or logical. You can also use fdisk to fix the partition order in the partition table if you need to. This will usually change the partition numbers, so you may have other work to do to restore your system to a working system. To make this change, use the x subcommand to switch to expert mode and then the f subcommand to fix the partition order, as shown in Listing 11. If you just want to see what the new partition order would be without changing it, you can use the q subcommand to quit as we have done in this example, rather than writing the updated partition table to disk. You can see from the menu of expert commands that many are unlikely to ever be used and you should only use them if you know what you are doing. Note also that the printout of the partition has a different format in expert mode. We will now look at adding partitions to GPT formatted disks using the gdisk command. We will add a 4GB swap partition and a 40GB data partition. The examples in this section use a CentOS 6 system. Warning: If you use gdisk on an MBR formatted disk, it will offer to convert the disk to GPT format. This might destroy data on your disk, so make sure you have good backups before you try this. Gdisk-partition- 1 shows gdisk starting using the MBR disk we used above (/dev/sda), and then using a GPT formatted disk (/dev/sdc). We will use /dev/sdc for our two new partitions. As with fdisk, you can get help. Use the ? subcommand as shown in . shows how to add our two partitions. Initially, they will both default to Linux data partitions (type 8300). Note the use of +4G and +40G to specify the last sectors of the partitions. Now we will change the partition type for /dev/sdc2 to Linux swap. shows the available types and how to change /dev/sdc2. We also show the resulting partition table, including the first partition that was already on the disk. Notice that /dev/sdc1 has a type of 0700 which is Microsoft basic data. The partition is actually formatted as a Linux ext4 filesystem. Some partition types, such as Microsoft basic data, matter to some operating systems. Others, as in this case, are merely hints to an operating system. Our final task is to verify the partition table and write it. We show this in . The final warning about needing to reboot is because we had /dev/sdc1 mounted. As we said earlier, it’s generally better to repartition a disk when it has no mounted filesystems. By now, you will not be surprised to learn that you can also use parted in interactive mode. You can use it for either MBR or GPT formatted disks. One big difference between parted and either fdisk or gdisk, is that parted executes its subcommands immediately and updates the partition table as you go. shows how to start parted to update /dev/sdc. You can get a list of commands and help on individual commands. We illustrate individual help for the mklabel subcommand. Commands can be abbreviated to the minimum unique abbreviation, so we could have used h mklabelhmklabel instead of help mklabelhelpmklabel. We also print the partition table and you can confirm that /dev/sdc1 is the only partition that is formatted and indeed it is formatted as ext4. Note that parted uses decimal powers rather than binary powers for MB, GB, etc, so the 40GB partition that was added by gdisk now appears as 42.9GB using parted. We will now add two more Linux filesystem partitions using the mkpart subcommand. You could use the mkpartfs command to both make a partition and format it, but parted recommends using the more robust partition formatting tools that we will meet shortly, so we’ll just use mkpart as shown in . You may have noticed that parted asked us about the filesystem type but not the partition type code. We specified xfs for one and defaulted to ext2 for the second. In theory, parted uses the intended filesystem type to determine the correct partition type. 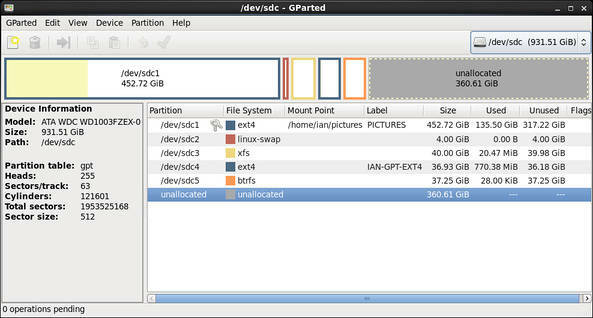 uses gdisk to show the types that parted assigned to our new partitions. Probably /dev/sdc1 was created using parted or perhaps gparted. Linux supports several different filesystems. Each has strengths and weaknesses and its own set of performance characteristics. One important attribute of a filesystem is journaling, which allows for much faster recovery after a system crash. Generally, a journaling filesystem is preferred over a non-journaling one when you have a choice. You may also want to consider whether your chosen filesystem supports Security Enhanced Linux (or SELinux). Two newer file systems, ZFS and btrfs, use a technique called Copy on Write to improve data integrity and address large storage needs. Following is a brief summary of the types you need to know about for the LPI exam. See resources on the right for additional background information. The ext2 filesystem (also known as the second extended filesystem) was developed to address shortcomings in the Minix filesystem used in early versions of Linux. It has been used extensively on Linux for many years. There is no journaling in ext2, and it has largely been replaced by ext3 and more recently ext4. The ext3 filesystem adds journaling capability to a standard ext2 filesystem and is therefore an evolutionary growth of a very stable filesystem. It offers reasonable performance under most conditions and is still being improved. Because it adds journaling on top of the proven ext2 filesystem, it is possible to convert an existing ext2 filesystem to ext3 and even convert back again if required. Faster file system checking because unallocated blocks can be skipped during checks. Delayed allocation and multiblock allocators to improve performance and reduce file fragmentation. Timestamp changes that provide finer granularity, a new creation date (which will require eventual updates to many other libraries and utilities to become fully useful). A further timestamp change addresses the year 2038 problem which is caused by storing timestamps as signed 32-bit integers. XFS is a filesystem with journaling. It comes with robust features and is optimized for scalability. XFS aggressively caches in-transit data in RAM, so an uninterruptible power supply is recommended if you use XFS. Swap space must be formatted for use as swap space, but it is not generally considered a filesystem. This filesystem (also known as FAT32) is not journaled and lacks many features required for a full Linux filesystem implementation. It is useful for exchanging data between Windows and Linux systems as it can be read by both Windows and Linux. Do not use this filesystem for Linux, except for sharing data between Windows and Linux. If you unzip or untar a Linux archive on a vfat disk, you will lose permissions, such as execute permission, and you will lose any symbolic links that may have been stored in the archive. ReiserFS is a B-tree-based filesystem that has very good overall performance, particularly for large numbers of small files. ReiserFS also scales well and has journaling. It is no longer in active development, does not support SELinux and has largely been superseded by Reiser4 whose future is unclear. Like most new filesystems, it takes a long time for the system to gain enough stability for users to commit important data to it, so it is not yet the mainline filesystem for most Linux distributions. The ext3 filesystem is mature and was used as the default filesystem on many distributions. The ext4 filesystem is now replacing it as the default filesystem on several distributions, starting with distributions like Red Hat enterprise Linux 6. Fedora 17 and Ubuntu 12.10. The ReiserFS filesystem was used for many years as the default on some distributions, including SUSE, but is not widely used today. Linux uses the mkfs command to create filesystems and mkswapcommand to make swap space. The mkfs command is actually a front end to several filesystem-specific commands such as mkfs.ext3 for ext3, mkfs.ext4 for ext4 and mkfs.btrfs for btrfs. What filesystem support is already installed on your system? Use the ls /sbin/mk`ls/sbin/mk` command to find out. An example is shown in Listing 20. You will notice various forms of some commands. For example, you will usually find that the files mke2fs, mkfs.ext2, and mkfs.ext3 are all the same file, while mkfs.msdos and mkfs.vfat are usually symbolic links to mkdosfs. Filesystems that may be needed to boot the system will usually use hard links to provide the different names for the same file. Filesystems that cannot be used for the / filesystem in Linux, such as vfat or msdos, may use symbolic links instead. The tutorial “Learn Linux, 101: Create and change hard and symbolic links” will help you learn about these different kinds of links. There are a few common options for all mkfs commands. Options that are specific to the type of filesystem being created are passed to the appropriate creation command, based on the type of filesystem specified in the -type option. Our examples use mkfs -typemkfs-type, but you may use the other forms directly with equal effect. For example, you may use mkfs -type ext2mkfs-typeext2, mk2fs, or mkfs.ext2. For the manual pages for a specific filesystem, use the appropriate mkfs command as the name, for example, man mkfs.ext3manmkfs.ext3. Many of the values displayed in the output examples below can be controlled by options to mkfs. Now that we have created all our partitions, we will reboot the CentOS 6 system and format the filesystems using that rather than the somewhat slower live Knoppix DVD. Of course, you could continue to use a live system if you wished. Remember that you need root authority to create filesystems. Let’s format the /dev/sdc3 partition as ext3 using the mkfs command as shown in Listing 21. 180 days, whichever comes first. Use tune2fs ‑c or ‑i to override. Note that a journal is created with ext3. If you wish to add a journal to an existing ext2 system, use the tune2fs command with the -j option. A useful option for ext2, ext3, and ext4 filesystems is the -L option with a name, which assigns a label to the partition. This can be used instead of the device name when mounting filesystems; it provides some level of insulation against changes that may need to be reflected in various control files. To display or set a label for an existing ext2, ext3, or ext3 filesystem, use the e2label command. Labels are limited to a maximum size of 16 characters. A more recent development is to use a universally unique identifier, or UUID, rather than a label. A UUID is a 128-bit identifier usually displayed as 32 hexadecimal digits in groups of 8, separated by four hyphens. Most Linux filesystems generate a UUID automatically when the filesystem is formatted. Use the blkid command (which does not need root authority) as shown in Listing 22 to see the UUID for the partition we just formatted. UUIDs are more likely to be unique than labels and are especially useful for hot-plugged devices such as USB drives. Now let’s create an ext4 filesystem on our new partition, /dev/sdc4. With the -L option of mkfs, label the partition and also show the GUID using the blkid command as we did for the ext3 partition above. Ext 4-part illustrates this. Notice that the first line of the mkfs output confirms that the work for creating both ext3 and ext4 filesystems is being done by mke2fs. To see all the parameters that you can specify when creating an ext4 partition, consult the man pages for mkfs.ext4. Let’s now format /dev/sdc3 the partition we just formatted as ext3 using the XFS filesystem. If you are using SELinux (Security Enhanced Linux) with XFS, you should specify larger inodes than the default of 256 using the -i parameter. The recommended value is 512. This is because the default size of 256 bytes is not large enough for the SELinux XATTR and it would have to be stored in a separate node. Notice that the XFS formatter notifies you if it finds a recognized filesystem already on the partition. Note also that the UUID was reassigned by the XFS format. mkfs.xfs: Use the ‑f option to force overwrite. You can label an XFS system using the -L option with a name. Or you can use the xfs_admin command with the -L option to add a label to an existing XFS filesystem. Use the -l option of xfs_admin to display a label. Unlike ext2, ext3, and ReiserFS, XFS labels have a maximum length of 12 characters. UUIDs for vfat filesystems are shorter than normal UUIDs and therefore somewhat less likely to be unique. If you want a label instead, use the dosfslabel command. Labels for DOS partitions are limited to 11 characters in length. For our last filesystem, we’ll format out GPT partition, /dev/sdc5, using the btrfs filesystem as shown in . By now, you know to consult the man pages for mkfs.btrfs to find out more about the available options. Now let’s create some swap space on the /dev/sdc2 partition using the mkswap command as shown in Listing 28. Note that recent versions of mkswap show you the generated UUID. Unlike regular filesystems, swap partitions aren’t mounted. Instead, they are enabled using the swapon command. Your Linux system’s startup scripts will usually take care of automatically enabling your swap partitions. The following tools and filesystems are not part of the LPI objectives for this exam. This very brief overview touches on some of the tools and filesystems that you may encounter. Many Linux distributions include the cfdisk or sfdisk commands and their GPT analogs cgdisk and sgdisk. The cfdisk command provides a more graphical interface than fdisk, using the ncurses library functions as shown in Figure 1. The sfdisk command is intended for programmer use and can be scripted. Use it only if you know what you are doing. You may have to install gparted as it may not be part of your default install. Many distributions allow you to partition your disk, and sometimes shrink an existing Windows NTFS or FAT32 partition, as part of the installation process. Consult the installation documentation for your distribution. The logical volume manager (or LVM) for Linux allows you to combine multiple physical storage devices into a single volume group. For example, you might add a partition to an existing volume group, rather than having to carve out contiguous space large enough for your desired filesystem. The tutorial “Learn Linux 101: Hard disk layout” has more information and an example of creating filesystems with LVM. Note that btrfs also supports multiple volumes. RAID (Redundant Array of Independent Disks) is a technology for providing a reliable data storage using low-cost disks that are much less expensive than the disks found on high-end systems. There are several different types of RAID, and RAID may be implemented in hardware or software. Linux supports both hardware and software RAID. You will probably encounter filesystems besides those discussed above. IBM’s Journaled File System (JFS), currently used in IBM enterprise servers, is designed for high-throughput server environments. It is available for Linux and is included in several distributions. There is a new enhanced journaled file system (JFS2) designed to accommodate a 64-bit kernel and larger files. It was introduced in IBM’s AIX 5.1 operating system. The original JFS is sometimes now called JFS1. To create JFS filesystems, use the mkfs.jfs command. You may need to install the jfsutils package to get JFS support. There are other filesystems too, such as the cramfs filesystem often used on embedded devices. This completes your introduction to creating partitions and filesystems. Filesystem Hierarchy Standard Visit the home of the Filesystem Hierarchy Standard (FHS). Linux Standard Base (LSB) Learn about the Linux Standard Base (LSB), a Free Standards Group (FSG) project to develop a standard binary operating environment. Anatomy of ext4 Learn about the Anatomy of ext4. btrfs file system Learn about the btrfs file system (B-Tree file system). Reiser4 file system Learn about the Reiser4 file system, the successor to ReiserFS.